Author and paranormal investigator James Willis made his third appearance at Henry St. Clair Memorial Hall Thursday night. Willis shared amusing stories about his experiences investigating ghostlore in Darke County and elsewhere in Ohio. 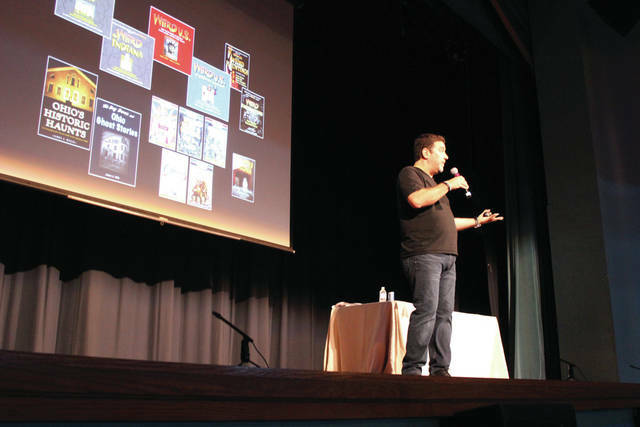 GREENVILLE — Author and paranormal investigator James Willis made his third appearance at Henry St. Clair Memorial Hall Thursday night. Willis shared amusing stories about his experiences investigating ghostlore in Darke County and elsewhere in Ohio. Willis’ group, Ghosts of Ohio, is based in Columbus with branches located in Cleveland and Cincinnati. Willis and his colleagues – paranormal enthusiasts from various walks of life – offer their investigative services free of charge, often conducting investigations in private residences and always agreeing not to reveal any information they might uncover publicly without the client’s consent. Willis has been investigating Ohio ghostlore since 1999. 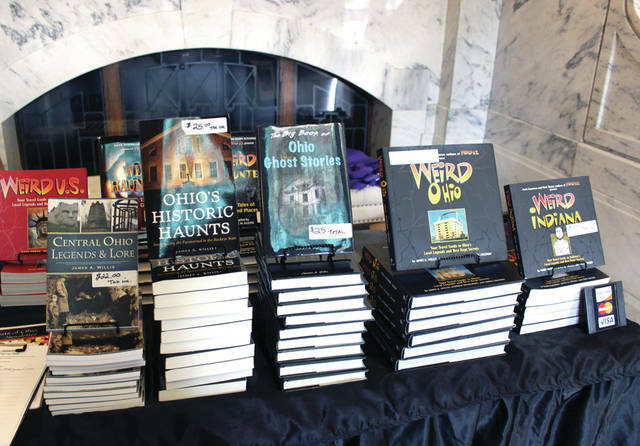 He’s written a number of books on the subject, including “Ohio’s Historic Haunts,” “Weird Ohio,” “Central Ohio Legends and Lore” and “The Big Book of Ohio Ghost Stories.” Locally, his group has conducted investigations at The Inn at Versailles and the Greenville Public Library. Findings from the latter investigation were unveiled at a similar event at St. Clair Memorial Hall in October of last year. Willis conducted more than 220 hours of face-to-face interviews for his investigation at the Inn. That experience, he said, proved to him that if nothing else, the people he was talking to sincerely believed in what they were telling him. Occupants of a particular room at the Inn have claimed to witness phenomena such as hands and faces emerging from the walls and ceiling, according to Willis, while cameras and microphones placed in an upstairs hallway captured what appeared to be the sounds of ghostly footsteps. Willis said that the Greenville Library has become “near and dear to [his] heart” because of his multiple investigations there, and stressed that while he may have uncovered evidence of unexplained phenomena, he didn’t believe there was anything evil to be found in the library. “There is nothing bad in this library,” Willis said, instead describing the supposed haunting as the work of a “trickster,” playfully poking fun at the library’s employees and patrons. Staff members have reported phenomena such as ghostly voices and phantom sounds of books and magazines rustling, mostly in the early-morning hours when patrons have not yet arrived. Willis discussed investigations elsewhere in Ohio as well, including an allegedly haunted office building in Mansfield, near the site of the former Ohio State Reformatory; the ghost of a patient said to inhabit a former asylum on the grounds of Ohio University in Athens; and sightings of a mysterious, possibly extraterrestrial creature known as the Loveland Frog. Willis also shared the story of an inexplicable experience he had shortly after he started dating the woman who would become his wife. Walking back to their car after an uneventful visit to a possible haunting site, he and the future Mrs. Willis saw a creepy message written in a snowbank, one that hadn’t been there when they walked by the same location only a few minutes before. This entry was tagged Ghost, Ghosts, Greenville, Greenville Public Library, Haunting, Henry St. Clair Memorial Hall, James Willis, Paranormal, The Inn at Versailles, Versailles. Bookmark the permalink.